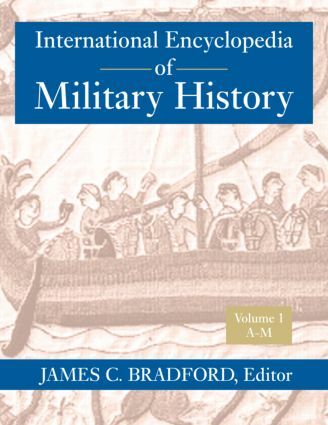 With its impressive breadth of coverage – both geographically and chronologically – the International Encyclopedia of Military History is the most up-to-date and inclusive A-Z resource on military history. From uniforms and military insignia worn by combatants to the brilliant military leaders and tacticians who commanded them, the campaigns and wars to the weapons and equipment used in them, this international and multi-cultural two-volume set is an accessible resource combining the latest scholarship in the field with a world perspective on military history. Antipersonnel Weapons. Arctic Warfare. AWACS. Biological Warfare. Bosnian Crisis. Campaign of D-Day. Cherokee War. Congress of Vienna. Continental Navy. Demobilization. Desertion. Ethnicity in the Military. Fedayeen. Finnish-Russian War. Game Theory. Geronimo, Chief. Gulf War. Hussein, Saddam. Irish Republican Army. Isolationism and the Military. Just War Theory. Land Mines. MAGIC. Mao Tse-Tung. Musket. Napalm. Napoleon. NATO. No Man's land. Palestine Liberation Organizations. Peace Keeping. Potsdam. Propaganda. Rangers. Samurai. Sherman, Admiral Forrest. Society and War. Spanish Foreign Legion. Submarine Warfare. Swift Boats. Taleban. Torpedo Boats. Trojan War. Viking Raids. War Crimes. and many more.